■ Close the front-passenger door, the rear doors and the tailgate. ■ Press the locking button . 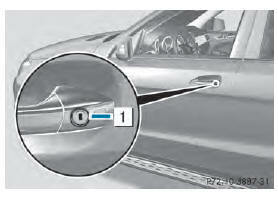 ■ Check whether the locking knobs on the front-passenger door and the rear doors are still visible. Press down the locking knobs manually, if necessary . ■ Turn the mechanical key clockwise as far as it will go to position 1. ■ Make sure that the doors and the tailgate are locked.